Dedicated to waffling since 1993. Blog-aversary – A life update. (Audience) – “Oh goodness here she is again, probably about to say the same start up line ‘It’s been a while’. Hello you lovely lot, you’re probably wondering who the hell I am it’s been that long. There have been dissertations, new careers, old careers, holidays, tears, laughter and a hell of a lot of procrastination since we last spoke. During that procrastination 6 months have upped and gone and I’m not sure where? But like I said in previous posts, it’s sort of how I work. I feel like I have been running on empty so instead of squeezing out blog posts I’ve been doing everything other than that. However, I really want to turn things around and post more regularly – I’m sure you’ve heard all this before but I’m going to try, and there’s no harm in trying hey! 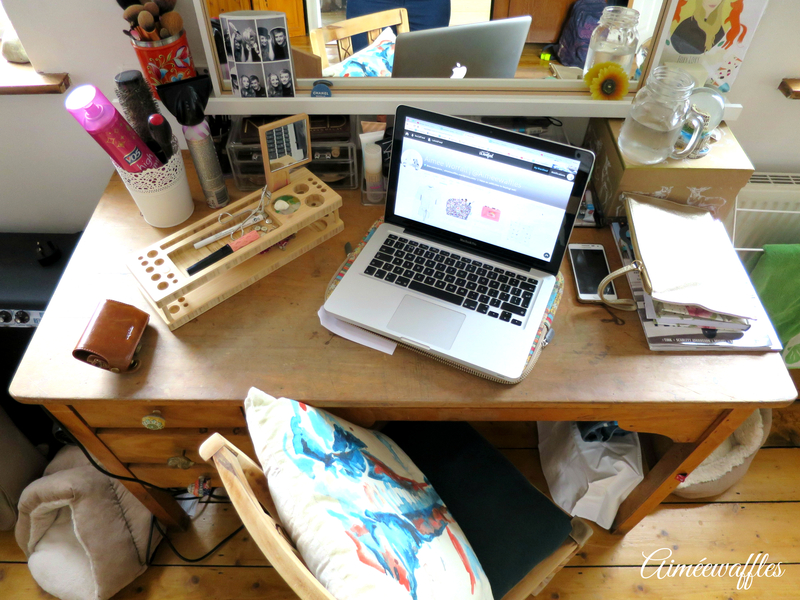 From the blog title, it’s my blog-aversary (hip hip hooray) and it’s not quite where I thought my little-rough-around-the-edges-blog would be but we’ve come a little way within 12months but we’re definitely moving. I want to eventually re brand this blog to make it that little bit more glam and up to date for you all, who doesn’t love a refresh?!? As for me, I am completely refreshing my life, well it certainly feels like it. I have finished my university degree and successfully passed with a 2:1. I really didn’t think it was do-able but I did it and I am so so thrilled about it, it’s motivated me to grab life by the balls and to give anything a go. So, I quit my job of nearly 5 years to pursue a new career. Pretty scary. So far it hasn’t turned out to plan and now I’m feeling slightly confused to where I’m heading in my life (any advice would be much appreciated), I feel like I have done all this hard work at uni to just land a job that I could of got without a degree. The thought of sitting in a office all day literally kills me as well, but I feel if I don’t try things then I won’t know if I like them or not, so that’s where I am at the minute. Feels like one of the weirdest times of my life to date, but it’s kind of exciting not knowing what’s round the corner. Anyway, enough of the deep chat – I’ve done a lot of fun stuff since February and I will be sharing it with you all, so watch this space. I hope you’re prepared to be visiting Italy on your next dose of waffle! Grab that cup of tea and sneaky biscuit and I’ll give you a taste of my little Italian adventure. I hope you have a great rest of the week/weekend and I’ll see you back on here before you know it – Ciao for now! 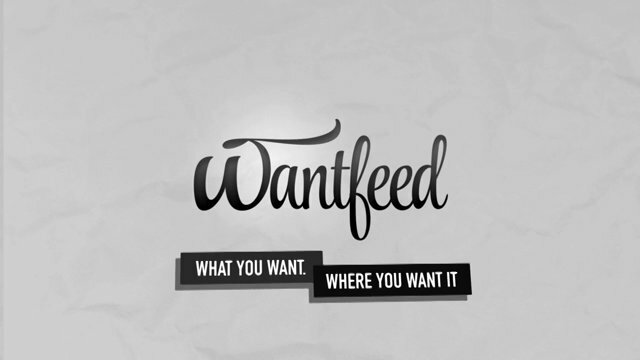 //Wantfeed, my new favourite website. If your anything like me and see a million things you want to buy and have many tabs open so you don’t forget then fear not, loads of open tabs has come to an end. 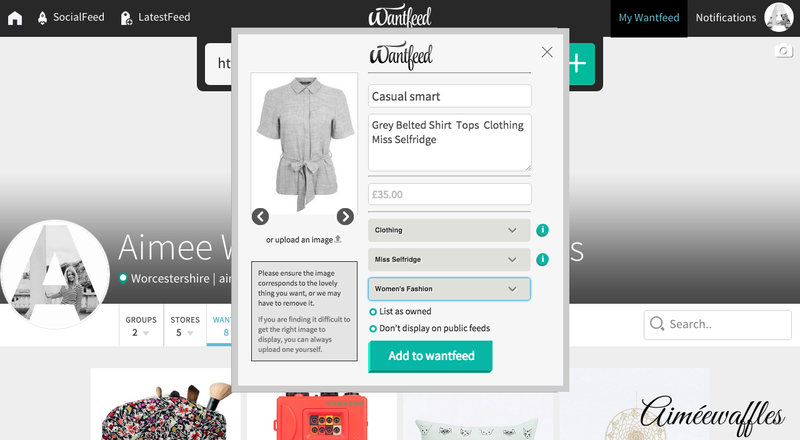 Wantfeed is a fairly new website where you can store and curate things from around the web into your own personal wantlist – Quoted from Wantfeed. 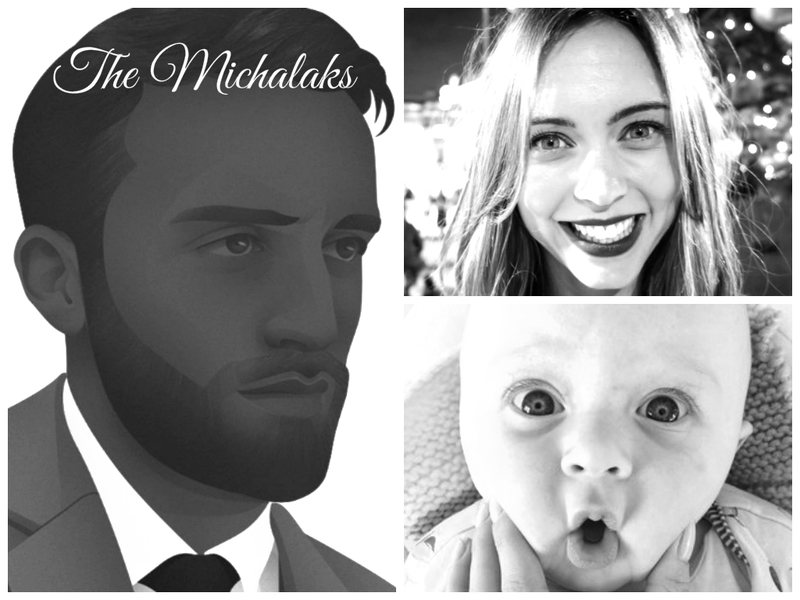 //The designer, Stefan Michalak, is becoming a youtube sensation with his wife and their son, Grayson creating family home videos. I have been watching these guys since Hannah first started to make youtube videos about beauty and have followed them ever since, they are my guilty Monday morning youtube pleasure. Go check them out, you’ll fall in love with them and their coffee addiction. //After signing up which you can do via email or Facebook, this is what you can expect to see on your home page which will have a list of trending products which people are currently potentially interested in buying. //Don’t laugh at my lack of followers, I’m new too! (You could always follow me hint hint). Your personal home page will allow you to like other peoples products, purchases, follow and post what you already own. //How do you work it did I hear you ask? Well simply find a product you like and copy the URL, then enter the URL onto your homepage and press the big green + button. //Wallah! Bingo! It then adds the desired product to your page. //You then begin to fill in the details about the product such as the title, description, price, group, store and tag. Simple. //It is a genius idea and he recently made a big announcement on Wantfeed which benefits everybody using the site. 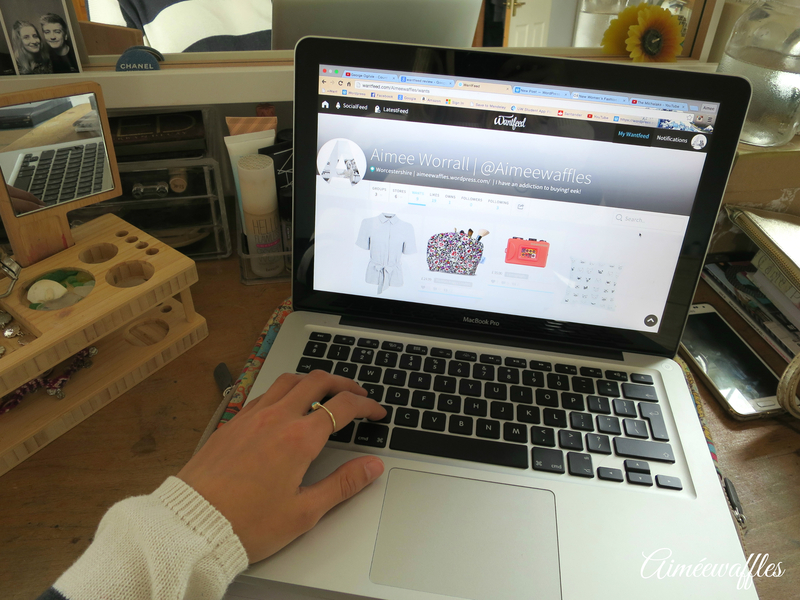 //Sit back and get browsing because after all you won’t forget products anymore! You can use this website via desktop or iOS app, so get downloading! Check out my other posts if you feel like it! Do you have any favourite websites? Let me know. Oh look, she did it again. Our big fat Greek adventure. For the love of Lomography. aimeewaffles on The need for Wantfeed. 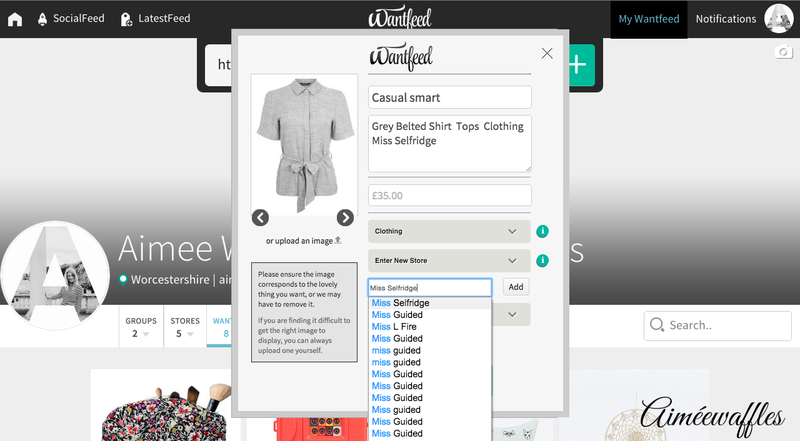 fromwherenicolestand… on The need for Wantfeed.